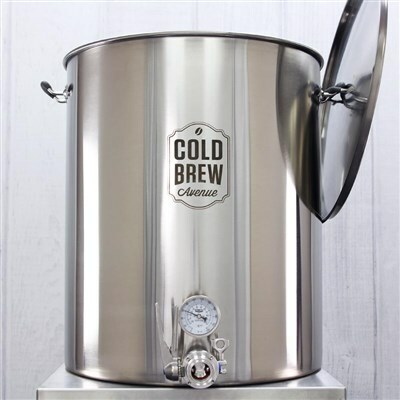 Our Large Batch / Commercial Cold Brew Coffee Makers allow you to make large quantities of cold brew coffee with ease. 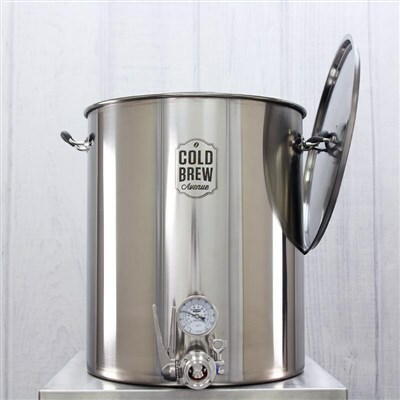 They are designed to filter directly into your serving vessel - whether that be a growler, bottle or even kegs for serving cold brew or nitro coffee on draft. 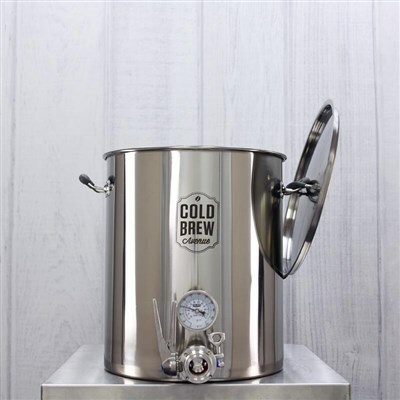 These systems were specifically designed with the coffee shops, roasters, restaurants and bars in mind, who are looking for a cleaner, easier and better way to brew large batches of cold brew coffee. 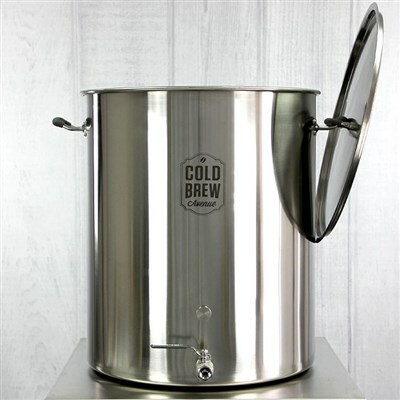 Our system features a custom Cold Brew Avenue Stainless Steel Brewing Kettle, and a custom fit Stainless Steel Cold Brew Coffee Filter Basket for brewing anywhere from 5–30 gallons* of ready to drink, or cold brew coffee concentrate! 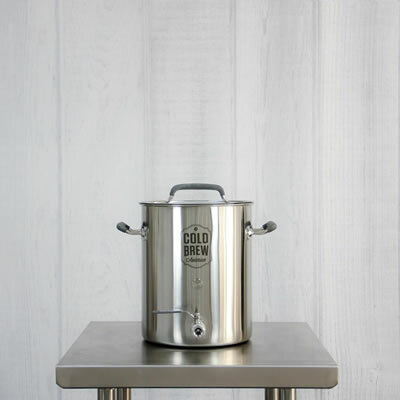 Our commercial cold brew coffee system was designed with you in mind. No more messy, hard to clean cheap nylon bags for filtering your coffee grounds. No more cheap plastic buckets and components. Our heavy duty filter basket allows you to rinse out old coffee grounds with ease! 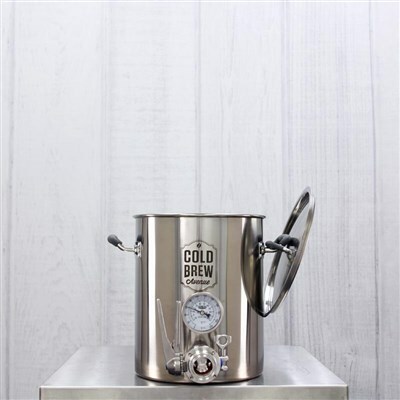 The Kettle, Filter Basket, Ball Vale and Hose Barb are all made completely of 304 Brewer's Grade Stainless Steel, which means it's more sanitary than plastic and made to last! 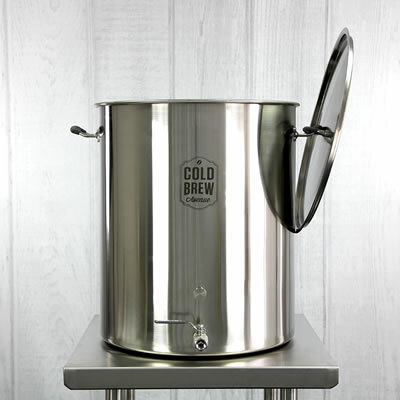 Our Cold Brew Coffee Filter Basket was designed with a specific micron level; allowing your coffee grounds and water to sit in the maximum area possible of the kettle, allowing you to extract every bit of flavor from your coffee, while still being able to filter every bit of coffee ground from the cold brew coffee. After your coffee has brewed for the desire amount of time, simply connect the 3' of 1/2" I.D. Silicone Hose that is included with your Large Batch Cold Brew Commercial Coffee System, and open the ball valve. 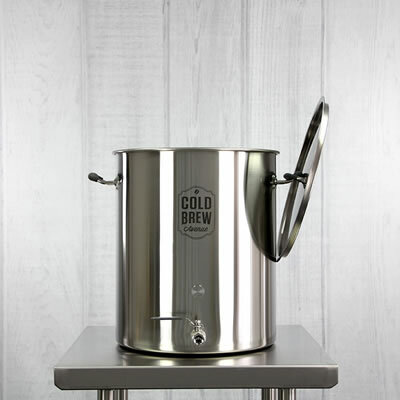 Your cold brew coffee will flow from the kettle, filtered and ready to drink in just minutes! No clogging, no slowing, just perfect, cold brew coffee ready to enjoy the second you open the valve.